Origin: Native animals in North America, comprising several genera of which Sciurus seems to be the most important with respect to their structural nuisance potential. The Eastern Gray Squirrel is very widely found, due to its introduction from its native eastern U.S. into the western states. Fox squirrels also represent a large group of widespread species. Biology: (Sciurus carolinensis) Squirrels are usually gray, sometimes red, brown, or black. Adults average about one pound in weight. They can supposedly live for up to ten years, but life expectancy in the wild probably isn’t more than 3-4 years. Squirrels give birth to two litters per year – one in late summer, and one in winter. The female gives birth to 3-4 young after a 44 day gestation, and the young grow quickly, and are weaned in about ten weeks. Tree squirrels nest above ground, in cavities in tree trunks or in aerial nests they construct. Their diet is primarily nuts, seeds, berries, fruit, and flowers and flower buds. They may also feed on tender bark, and occasionally on insects, bird eggs or young birds, mice or other small animals. Tree squirrels are diurnal, or active in the daytime. They may live as long as 12 years, but between 4 and 7 years is more normal in nature. They have one to two litters per year, usually in very early spring or late winter, with 3 to 6 young per litter. They do not hibernate, but their activity may diminish a great deal in the winter months. 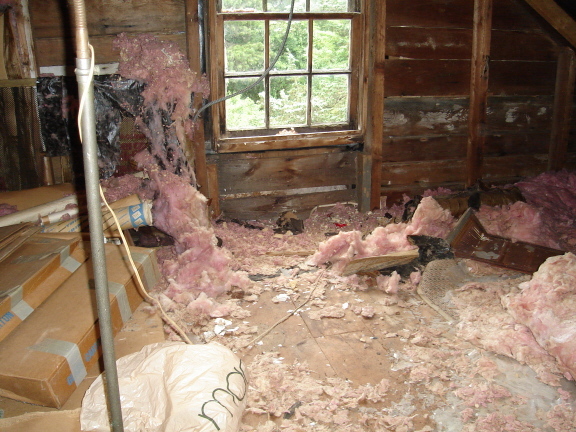 Around structures they can be destructive to wires or other utilities that enter the structure, and commonly find their way inside attics where they cause great damage to wires and other materials inside. It also is common for them to fall into vents or chimneys on the roof, or possibly find their way into wall voids, where they may die and cause odor and pest problems. They may enter through openings only 1.5 inches wide. Identification: Tree squirrels may be distinguished from ground squirrels and from chipmunks by their long, bushy tails, the lack of dorsal stripes, spotting or flecking, and the lack of internal cheek pouches. When disturbed they flee for the security of a tree, rather than to a ground burrow. Colors vary widely from species to species, with the gray squirrels being the namesake gray, fox squirrels a dark reddish brown, and flying squirrels a silky brown with a white belly. Sizes also vary, from the smaller flying squirrels at only 10 inches from nose to tip of tail, while the gray squirrels are twice that size, up to 22 inches long. Characteristics Important in Control: In general, tree squirrels are protected animals, and it is illegal to kill them without specific permission from a wildlife agency. If tree squirrels are found to be causing serious damage permission may be given to trap and relocate them, or to kill them if necessary. Exclusion from a building is the most important control measure for these animals, and removal by live-trapping the best alternative if they have entered. For these reasons, many people wish to have squirrels trapped and removed. SQUIRREL BEHAVIOR: Squirrels are most active in morning and evening. Squirrels eat mostly nuts and seeds. They live in a variety of habitats, both forest and suburban or city areas. They establish home territories, and often communicate via scent, chattering, and flickering of the fluffy tail. NUISANCE CONCERNS: Squirrels love to live in attics. They also love to chew, and will chew on houses or wires, ducts, pipes once inside an attic. People don’t like the noises of squirrels running about above the ceiling or in the eaves, but it’s really the chewing that’s a problem. 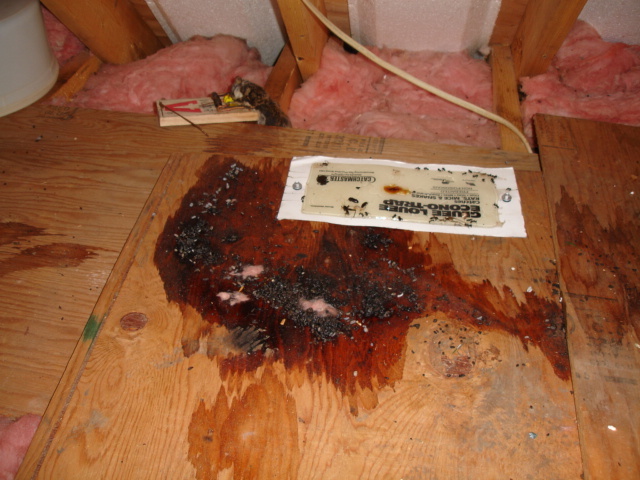 If squirrels chew on electrical wires in an attic, it can create a real potential fire hazard. 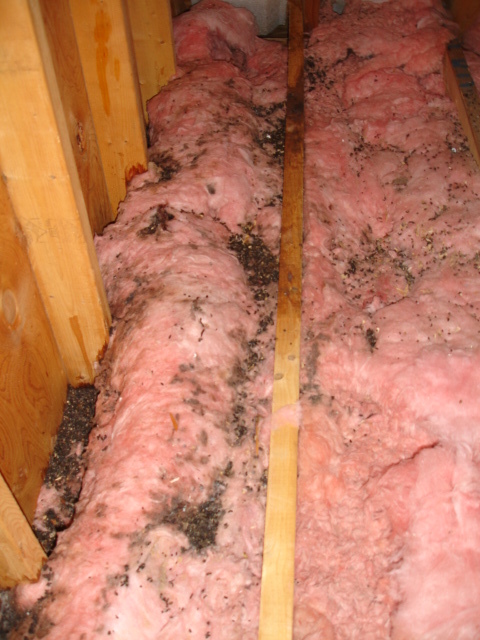 Squirrels also bring in nesting material and leave urine and feces in an attic. SQUIRREL DISEASES: No real important diseases, though they do carry parasites, and thus are vectors for the diseases that fleas, ticks, etc can transmit. They also leave a lot of droppings, which pose the usual excrement health risks, such as leptospirosis or Salmonella.